DAMM is a world-leading provider of communication systems for rail and metro, supplying flexible and user-friendly digital radio infrastructure systems to industrial, commercial and public safety customers. Being a key player for more than 30 years within professional radio communication, DAMM is taking the lead through superior engineering and constant focus on customer needs and reduced complexity. Meet the need for more data by using TEDS for train control, or pushing data to the train information system, still within the same secure and independent communication platform. Reduce number of base stations and extending track-side coverage utilizing VHF in remote areas and high power output. Options include 25W TETRA and/or 50W DMR . Save installation and operation costs with a rugged, compact outdoor base station ideal for track-side installations. The BS422 is mast mountable direct at track-side due to EN 50128 approval. The BS422 offers best-in-class power consumption, lowering operational costs and enabling alternatives for energy supply, like solar power. Easy remote management with one application for all technologies. Full remote manageable base stations across technologies, in hybrid operation, eliminating the need for on-site service, and making it ideal for remote sites. Improved Tunnel coverage, Improved node synchronisation, eliminating the need for GPS coverage by utilizing IEEE 1588 for node synchronisation. Alternatively use the simulcast option of the BS422; same network management platform, full output power and sensitivity. Through the cooperation with leading rail and metro providers worldwide, DAMM understands the critical importance of communications within transport infrastructures. DAMM’s TetraFlex® solution delivers high-performance digital TETRA voice and data communications providing crucial communications integration across railway operations, enhancing efficiency and safety as well as the satisfaction of personnel and passengers. 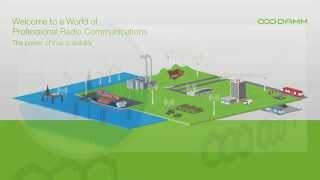 TETRA (terrestrial trunked radio) was developed by ETSI, the European Telecommunications Standards Institute. TETRA technology is currently being used in thousands of mission-critical applications across more than 160 countries, and has proven its value in countless rail and metro applications as being superior to GSMR. The IP65 encapsulated and ruggedised outdoor base station has been optimized for use within rail and metro operations. With its compact size, it is ideal for use in the harsh environments of metro tunnels or direct outdoor mounting. DAMM demonstrate best-in-class power consumption, combined with no need for housing or air conditioning, this gives significant saving both on installation as well as operation. The fully IP-based technology used by DAMM TetraFlex® digital voice and data communications solutions makes it possible to create integrated communications across multiple stations, logistics facilities, depots, maintenance facilities and centralized operational control centres. It also means that the system can support any capacity, from single-site stations to large railway and metro infrastructures with thousands of users. Up to 16 carriers per node, allowing for 63 time slots, or up to 4 control channels to secure SDS traffic and position reports. DAMM TetraFlex® data services provide data for i.e. vehicle-tracking systems, timetable and journey information, signaling control or SCADA and telemetry data, supporting third party applications, such as vehicle management systems.The advanced management of Packet Data channels enables reliable and deterministic bandwidth for data applications. DAMM TetraFlex® comes complete with integrated applications. With the intuitive DAMM TetraFlex® dispatcher solution all users can easily be dispatched by the operational centres. DAMM TetraFlex® also provides a complete voice/data recording and replay facility, enabling effortless incident reconstructions and gathering valuable statistics on operational performance. DAMM TetraFlex® is supplied with an easily accessible Application Programming Interface (API) that allows straightforward development and integration of customer-designed applications.